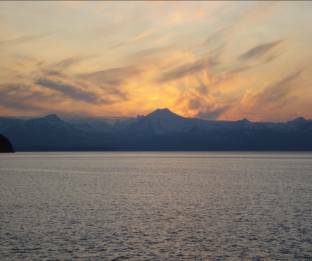 The night processors apply correctors for variables that can affect the data such as tides, sound velocity, true heave and TPE (total propagated error). Then they can generate a surface of the sea floor. Finally, they must look for flyers; data points that are inconsistent with the statistical model. This is where the technology is so cool! 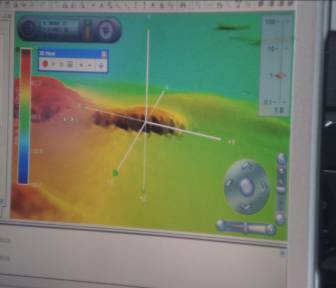 The software enables you to view the surface in 3D. Using your mouse, you can literally fly over and under your surface. The night processors add their comments to the acquisition log and create a tiff file to show the sheet managers the coverage for the day. A detailed report about the area surveyed (DR) is written and submitted. The Descriptive Report (DR) is the written record of the survey work completed in an area. It accompanies and complements the digital data. Our survey area will not be completed during this leg of the trip. 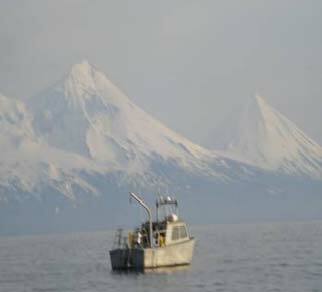 After some import time in Seward, AK for the Fourth of July, the Rainier will return to the Pavlof Islands to continue their survey. After data acquisition is complete and data has been reviewed aboard the ship to ensure it meets requirements, it is signed off by the Captain, the Chief Survey Tech, the Sheet Manager, and the FOO (Field Operations Officer). When the sheets are completed, they are sent to the Pacific Hydrological Branch in Seattle, WA. There, they will complete quality control analysis of the data and either accept or reject the survey sheet. They look for any data that is inconsistent with the required Specification and Deliverables. If the data does not meet specification, the area will likely need to be surveyed again. 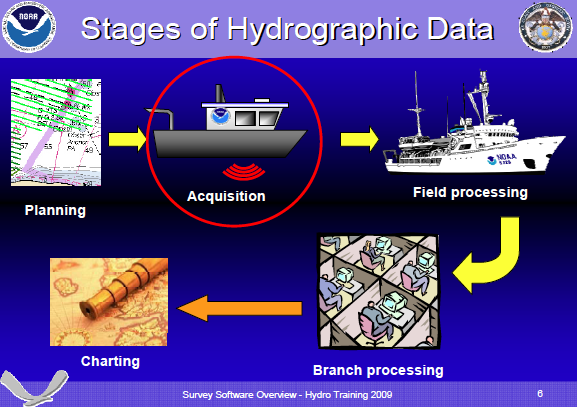 When the data is accepted by the branch they will further process the data to highlight important features and then send the survey sheet to the cartographers at the Marine Charting Division (MCD). The cartographers use the data submitted to place additional soundings and navigation hazards onto the US Navigation charts. A navigational hazard is generally defined as anything 1 meter shoaler than surrounding depths in water less than 20 meters deep. Currently, it may take years for a survey to be charted and reach the mariner. Critical corrections (such as DToNs -Danger to Navigation) or high priority areas can be updated more quickly. I’ve noticed that marine measurements are not consistent in their use of one system. Some measurements are in meters, some in feet, some in fathoms and some in ancient mariner terms such as shots. Since we “speak only metric,” in my class, I asked why mariners don’t stick to just one system of units. The explanation I received makes sense. Navigation of the seas is a world-wide occurrence. Crews aboard vessels are often multi-national. Using a system that is accepted world-wide makes sense. Each day I go out on the launch, I feel more a part of the team. I can comfortably cast and log data on the launch computers. I am starting to understand more about running the sonar. Each day, I get to practice my boat driving skills. Thanks especially to coxswain Foye, I have even completed a starboard side pick up for a man overboard drill! As always, safety is a key component. We practice drills on board as well as on the launches. On the launches, we do radio and iridium phone check-ins periodically. You can keep track of where we are by using Shiptracker. Word of the Day Shot: 90 feet of chain; used to describe how much anchor chain to let out. 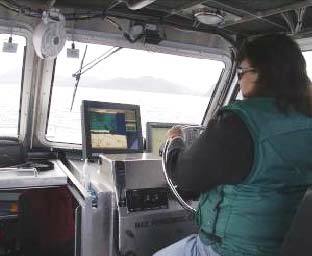 This entry was posted in 2009, Mary Patterson, NOAA Teacher at Sea and tagged Alaska, ctd cast, data processing, hydrographic data, Hydrographic survey, multibeam sonar, noaa ship rainier, seabirds. Bookmark the permalink.